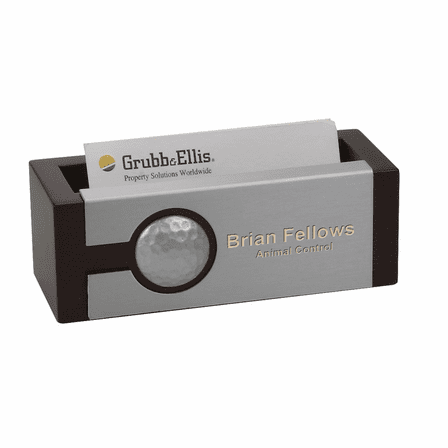 The ideal gift for the golf fanatic, this golf theme desktop business card holder will brighten up the mood in any office. The body is made of solid cherry finish wood and holds up to thirty business cards with ease. 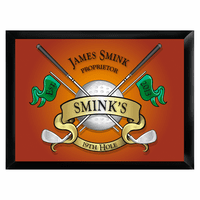 In front is a satin silver metallic plate with a raised golf ball emblem. 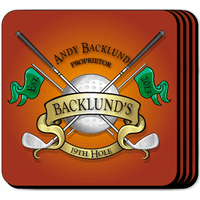 Add your own customized engraving to this plate for a one of a kind golfer's gift. The bottom of this golfer's desk card holder is line with felt to protect delicate desktops. It comes packaged in a gift box and ships out within one business day. Dimensions: 4 3/4" x 2" x 1 3/4"
This business card holder is really rich looking! 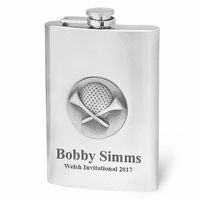 The engraving was perfectly sized, really NICE!